When you put money into your house, you generally get it back—and then some. Home renovations can increase the value of your home, but each home remodeling project will contribute to a higher sale price in different ways. New Leaf Remodeling is a construction company based in Rockford, IL, that specializes in kitchen, bathroom, and basement remodeling as well as home additions. This business aims to help customers upgrade their homes and increase the value of their properties. Make Your Home More Inviting & Attractive: Minor changes can make all the difference. For instance, painting your walls with a fresh coat of paint or replacing your kitchen cabinets with a more modern design can give your house a much-needed update. These changes can help the space feel lighter, more spacious, and ready for new buyers. Add New Convenient, Energy-Efficient Appliances: Nothing’s more appealing to potential homebuyers than a space that comes with all of the popular amenities like Jacuzzi® baths, brand new washers and dryers, and stainless steel appliances. If these home additions are also energy-efficient models, that’s even better. Not only will this influence potential buyers to add your home to the top of their wish list, but you’ll also enjoy the benefits that come along with lower utility bills. Improve Your Outdoor Space: Don’t forget about your home’s exterior when you’re taking steps to increase your property’s value. 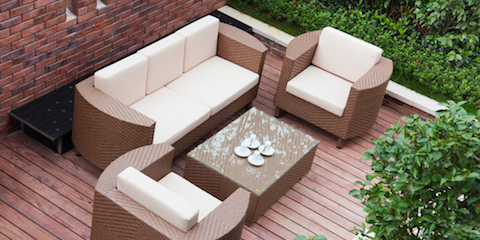 An outdoor entertaining space will increase the value of your home. Decks and patios can excite potential homebuyers and convince them to spend more money on your property, securing a solid return on your investment. Increase your home’s value by investing in certain home renovation projects. New Leaf Remodeling offers a variety of home improvement services like bathroom and kitchen remodeling and deck additions. Call their remodeling contractors at (815) 904-6006 and visit their website to learn more about their essential home services.